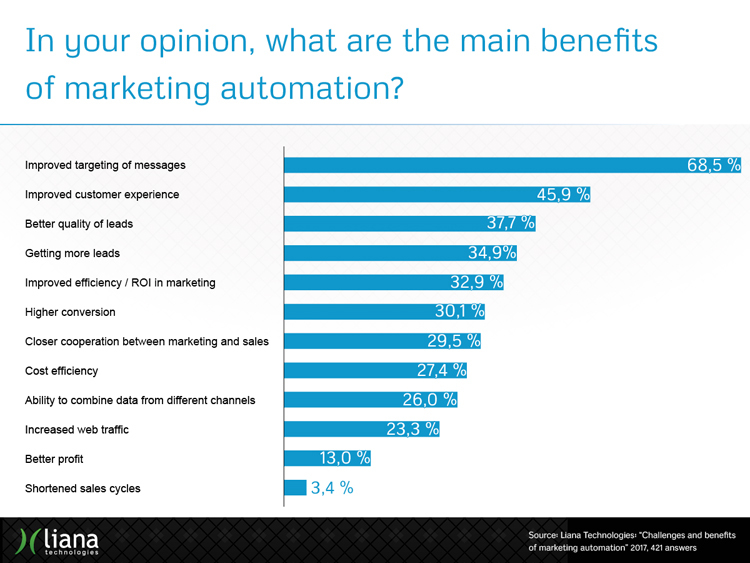 Blog›Survey: What are the Benefits of Marketing Automation? Liana Technologies conducted an international survey about marketing automation in May 2017. The survey was sent out to marketing and communications specialists around the world and it was filled out by 421 marketing professionals. The aim of the survey was to find out what the key benefits and challenges of marketing automation are: what marketing automation has helped companies to achieve, what things are seen as challenges in automation projects and why some marketers are still hesitant to start utilizing automation. Many marketers already utilize automation technology in their daily work: over a third of the survey respondents said that they already use marketing automation. The interest towards utilizing automation technology is high even among those companies that weren't using automation when the survey was sent out – almost 40 % of the respondents said that their company is going to invest in marketing automation within a year. Only about a tenth of the respondents said that their company will not start using marketing automation in the next 12 months. 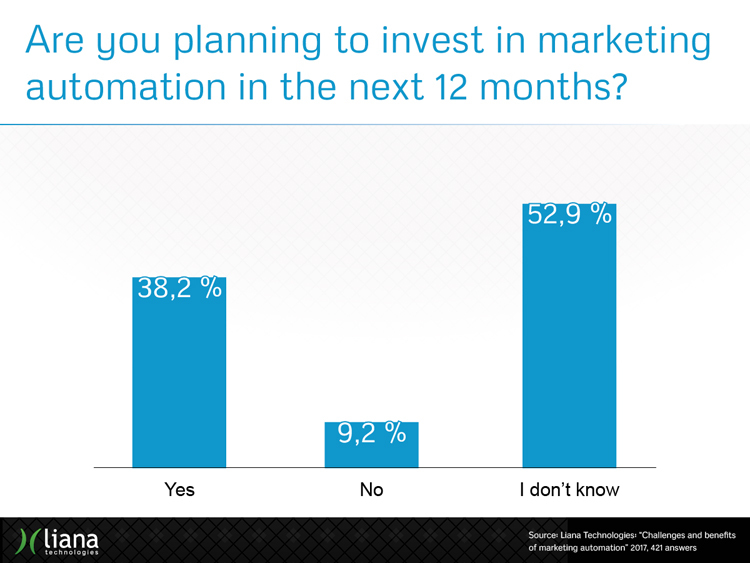 Image: Only about a tenth of the respondents stated that their company will not invest in marketing automation within 12 months. The question was presented to those respondents that weren't utilizing marketing automation at the time. Improved targeting of messages was clearly the number one benefit of marketing automation. Nearly 70 % of the survey respondents felt that the improved targeting of messages is the most important benefit of using marketing automation. This reinforces the widespread marketing trend that speaks against mass deliveries and calls for individual communication that is timely and relevant for the reader. Automation offers marketers the long-awaited technology that enables effective targeted communications. Image: How do companies benefit from marketing automation? 45,9 % of the respondents picked improved customer experience as one of the most significant benefits. Marketing automation technology helps to harness customer data and turn it into concrete marketing actions. The data doesn't just lie around in the systems unused, but instead is utilized to serve the customers better. An increased number of leads and their better quality was mentioned as a key benefit of marketing automation by over a third of the respondents. An automation tool is seen as an effective way to produce inbound leads to the sales team. The leads produced by marketing automation are also usually more ready for contacting. The sales team is also better equipped for contacting the customer, as marketing automation gives them important data about the potential customer. About a third of the respondents felt that marketing automation has improved the ROI of marketing (32,9 %), as well as the conversion rate (30,1 %). This shows that an automation tool affects the efficiency of the entire marketing chain. Investing in automation is clearly seen as worthwhile and it directly correlates with the important metrics in marketing. Download the full summary of the survey results. Juho is the Business Director specializing in marketing automation solutions at Liana Technologies. He firmly believes that choosing the right marketing automation platform makes all the difference in creating a better customer experience. You can connect with him on LinkedIn.